I was over at Megamall the other day. After looking at some irresistable gadgets, I proceeded to the record bar to buy a CD. On my way back to the other building, I stopped to look what the crowd was watching. 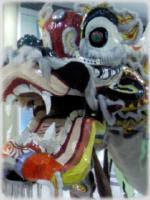 It were those long dragons that dance and bite the "ampao" hung from the ceiling of each store which served as goodluck for the year to come. 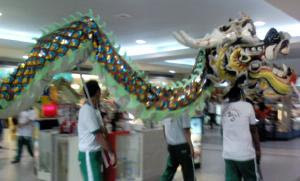 I took a picture of the dragon while it was resting for goodluck. Well, I didn't realize it until after I got home that I left my credit card in the last store I was in before I went home. It so happens that the cashier who was busy doing the bagger's job, was so preoccupied and forgot to hand me my card. I too was preoccupied looking at other items for sale while in front of the counter and thought I placed my card back in my wallet. When I got home, I was frantically looking for my card. I knew I hadn't misplaced it and so I traced back when was the last time I saw or used it. And it was in Megamall. I immediately checked the receipt for a phone number but unforunately there wasn't any contact. I then went online and tried to search for Megamall's phone number.. kinda impossible. I then figured that I have to look for the store's phone number and with the help of the ever reliable website ClicktheCity, I found the store's number. I called them up and told them my name, purchase, time I was there and the description of my credit card. Good thing the cashier surrendered it to their customer service and I was instructed to pick it up along with proper identification. The sad thing was that I called them up 30 minutes before closing time and there was no way I could make it. So I had to go there the next day to claim it. I figured the only way to make my trip back worthwhile was to buy a bunch of donuts. I was told that my horoscope says that this year will be a good and lucky year for me. I hope that missing credit card incident would be the last unfortunate incident for the year.